That was a week I won't forget in a hurry. I started the week full of gusto, that was when I went to bed Sunday night. 5 am Monday morning when alarm went off I woke up with my second lot of Man Flu for this winter. Must be my age. In true manly fashion I pulled up my socks and got on with it..anyone who knows me or had the misfortune of seeing me last week's knows this is utter nonsense. I went to my 6am Gym class winging like a baby. I got through the class without too many people noticing how poorly I was pretty well. Monday is my big gym day where I do a strength class in the morning and then a range of different classes in the evening. The last class is body balance which is like yoga. Luckily for me I have no shame and do not get embarrassed as I am as bendy and flexible as an iron bar. You can quite often hear ladies behind me giggling at my attempts at 'Dancers Pose' or 'Happy Baby', if you don't know what these are look them up and then imagine a lanky pot bellied middle aged man with zero flexibility doing them. Not pretty is it. I had a show on Wednesday, it was a market stall in the middle of Birmingham. I had to be there by 8am so up at 4.30, the dogs were not pleased at me disturbing them so early, Ralf was soon nudging his food bowl round the kitchen trying to get it filled up. That dog never stops thinking about food, funnily enough one of my daughters is exactly the same. I drove to Birmingham in good time apart from the last 3 miles which were awful, stop start stop start, desperate for a wee, things got so bad I was eyeing up the empty Costa cup, I decided against that, the idea of standing on a stall all day wet and smelling of wee didn't appeal. Luckily I was a big boy and held on. I set the stand up, I was one of five stands which should of told me something but filled with eternal optimism I stood waiting to say hi to the passing customers . Boy did I have a long wait...mid day came and I still hadn't even done a sample. That was a record in itself. The stall holders that had done it before said it was a lunch time crowd. So I waited and waited and waited..1.30 and I did my first sample. Still no sales, I was having a laugh with the other stall holders which always helps then just when I resigned myself to blanking a guy came up to the stand at 2.30 and spent £20. No sampling so chit chat just bought. The event closed at 3 so packed up, raided the float to pay the car park and headed home. Over 3 hours later arrived home. The day was so bad all we could do was laugh, I did a total of 3 samples and £20 in takings. So £20 is the new record low...that's the number to beat. 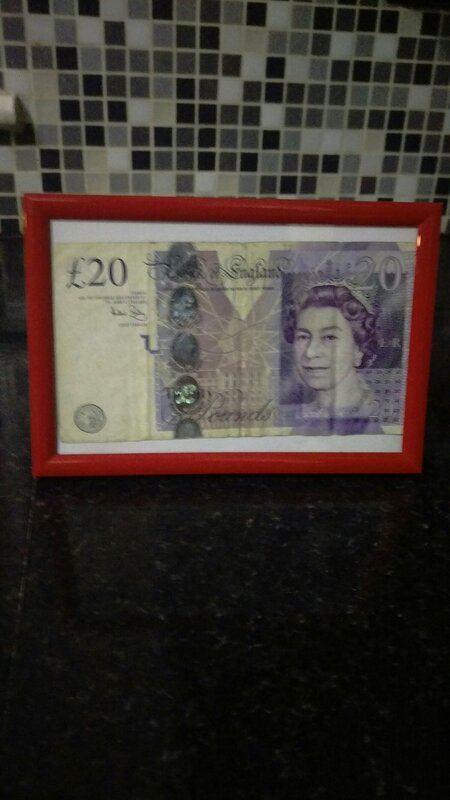 I took the actual £20 and stuck it in a frame and it sits pride of place in the kitchen. It's a great reminder, especially during the highs that it can quite easily be a £20 day. Friday night was the launch of our toffee vodka bar, at the local rugby club they let us set up and sell to the people attending the curry and race night they put on. It was only a small event but was a success. It was also great fun, toffee Vodka and Prosecco was the most popular, followed by single shots. It was an eye opener to be sober behind the bar seeing and listening to people getting drunk and then by the end of the night lining shots up and watching them neck them. Was a real laugh and certainly wasn't work. We even got two more bookings from it so happy days.